There are many more weeks of potential snow storms in front of us and our public adjusters in New York know what that means. The back breaking task of keeping one’s property safe from Mother Nature’s worst is apt to continue. One of the issues that New Yorkers may have to handle in that regard is the potential for roof collapse. According to the Insurance Institute for Business and Home Safety’s research, as little as 2.1 feet of snowfall could cause a New Yorker’s roof to collapse. The level of risk all depends on the type of snow, the snow load, the type of roof and what condition it’s in. In general, packed snow and ice tend to be the most worrisome because they can apply more than 20 pounds of pressure per square foot to a New York building’s roof. The amount of pressure per square foot that a roof can withstand safely varies based on several factors, including the age of the building and where it is located. However, the roofs of many buildings in New York cannot bear much more than 20 pounds of pressure. New Yorkers curious as to exactly how much pressure their buildings’ roofs can withstand should consider checking out four resources. Those resources are the Structural Building Components Association, the International Building/Residential Codes, the American Society of Civil Engineers and the building company responsible for the dwelling in question’s construction. They tend to have access to such critical information. To prevent a roof from collapsing, our New York public adjusters would like to stress that it’s important to periodically remove some of the pressure. This can typically be done by a property owner with the aid of a roof rake. It’s also obviously a great idea to keep one’s roof structurally sound year round. That will generally require the use of a licensed, bonded and insured contractor. Performing both tasks is likely to minimize the property owners’ risk of experiencing a winter roof collapse. 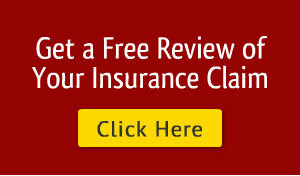 Our public adjusters in New York want to emphasize the value of reviewing one’s roof collapse coverage as well. After all, some homeowners’ or commercial insurance policies do not cover roof collapse damage claims, roof replacement and temporary relocation costs. Property owners that take all of the necessary precautions but still fall victim to a winter roof collapse should consider contacting our New York public adjusters. They can help file roof collapse claims and much more. To uncover additional details about how public adjusters in New York can help property owners deal with winter roof collapse related claims, please contact us at (877) 869-8989.